Whether or not we have a messy desk and an inability to appear on time for appointments, we are still inclined to organize the world around us. The most befuddled among us do manage to distinguish all sorts of things all day long. We alter our behavior based on the amount of light available. We divide everything into stuff we eat and stuff we do not- sometimes stuff we eat now and never again. My point is that we handle the world by organizing it. This is sport and this is not- the eternal arguments about bowling, billiards, and rhythm gymnastics. I suspect much of this divide and organize inclination starts early and is trained. Our caregivers go to a lot of trouble to teach us to keep things orderly. Big toys go in this box. Outdoor toys go by the door. Green beans go in the mouth and not the nose. As a side note, that may be why prejudice is easy to teach. It plays to our natural inclination to organize the world into categories. One of those early ways to organize the world is by art and science. Art makes things pretty and science makes things make sense. Your experience may vary, but none of us were privy to graduate school theory definitions of art or science when we first recognized the difference in ultimate output between the person who worked with all the test tubes and the person who worked with all the paint tubes. Our museums generally reflect the same well-defined borders. Unless… you have been to the main Carnegie Museum facility in Pittsburgh. Basically, the art and natural history areas are housed together. They make an attempt at distinguishing themselves, but the exhibits are interlaced across multiple floors like hands folded in prayer. 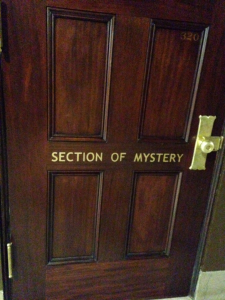 Sure, you could visit just one section, but why would you? I knew that a trip to the Carnegie promised the best of both worlds. Slowly, however, they revealed how everything was part of something else. The geodes were natural works of art. The architecture hall looked more like the dinosaur hall than the art galleries. The areas dedicated to native people and ancient Egypt displayed art and history and nature. The entire experience questioned the divisions that I had previously used as well as providing a view of the world that could be both orderly and a little chaotic. The top floor provided an escape from museum feet and overwhelming input with a long, narrow hall filled with birds and coins and what have you. The glass cases were perfect examples of just-put-some-cool-stuff-out-there and people appear. Categories do help (I prefer not to eat dirt). Yet, we have to recognize that they are a construct. Sometimes, in our more courageous moments, we need to let the walls between things become a little more porous. In those moments, we might find a door among the birds and coins that grants a way into our next great discovery. You’ve Got to Check This Out is a blog series about music, words, and all sorts of artistic matters. It started with an explanation. 84 more to go.